I recently made a new online friend, Sandi, aka kwiltnkats at the Quilters Club of America website. What a fun site to connect with other quilters. 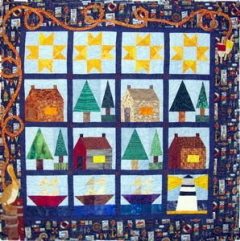 I just loved her rendition of my quilt design, South Shore Road, featured as a series quilt in Quiltmaker magazine from the January/February 2006 issue through the July/August 2006 issue. The subtle color scheme she used gives this quilt a quiet magnificence. It is so much fun to see someone else's interpretation of one of my designs. Sandi's quilt was used for an American Legion raffle. You can see more of her work at her blog, kwiltnkats.blogspot.com, her website, kwiltnkats.com, or in her gallery at Quilters Club of America. Here's a picture of some of the large hourglass blocks I made yesterday for the Raspberry Bridge Mix quilt. I made a total of 20 raspberry and chocolate hourglass blocks yesterday. Yum! Today I started working on some of the small chocolate and cream hourglass squares. 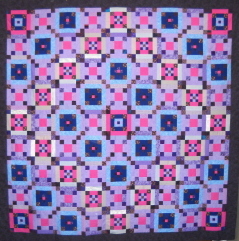 The pattern for this quilt is available for sale at the Curlicue Creations shop, curlicuecreations.com. And on to the "quilty" shopping! 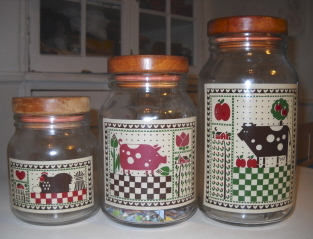 I now have a complete set of the barnyard jars with lids. I originally had only the pig jar, but a couple of weeks ago I found both the cow jar and the chicken jar and lids for all three. How cute! I am keeping snippets in the pig jar, and safety pins for basting in the cow jar. But what to do with the chicken jar? Hmmmmm? Chocolate stash maybe? 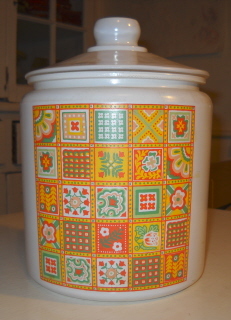 I found the cookie jar in a thrift store today for $2.00. I just couldn't pass it up! There are 16 different squares in the 25 squares printed on the jar. The kids and I had fun today picking out our favorites. Splendid! Plus, if I replace my old clear glass cookie jar with this one, Trent won't be able to see the cookies inside. That will eliminate a lot of crying for cookies. That's worth $2.00 for sure! Recently, I took the kids to visit the new "Story of North Carolina" exhibit at the North Carolina Museum of History in Raleigh, NC. The wholeness of the exhibit was fantastic. They had sections on Native Americans, Pirates, the American Revolution, early family life, and farming, and it was only "Part 1". The second half of this exhibit is scheduled to open in November. I really wish I had brought my camera to share with you. We saw antique stick pins, thimbles, and a sewing box. The most interesting item was an early American Flag for the 13 colonies. It was hand sewn with 13 large six pointed stars in rows in the top left corner, and the 13 stripes, too. It looked like it was made from whatever they had on hand. If you get a chance to visit Raleigh, the website for the museum is ncmuseumofhistory.org. Here's a photo of my Lollipops quilt hanging in the Quiltmaker Gallery in Golden, Colorado. It's the quilt on the right. It's just nifty to have my quilt hanging there with all the quilts by the block designers from Quiltmaker's 100 Blocks, Volume 3. I did block testing for this issue, and nine of the blocks I tested are featured in my quilt. The woven ribbon border and tiny checkerboard squares setting are my design. This quilt just came together on it's own, and is one of the most exciting quilts I have worked on to date. It was so much fun testing the blocks from different designers. Each block was unique and challenging in it's own way. I hope you get an opportunity to visit the exhibit. 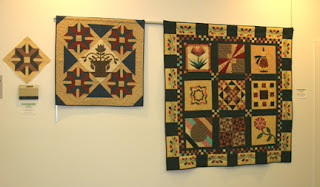 The quilts will be on display until September 1, 2011. You can find more information at Quiltmaker's blog, Quilty Pleasures, or at quiltmaker.com. 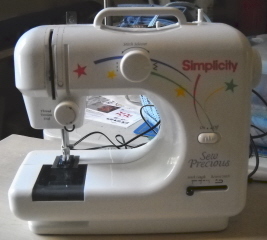 My latest acquisition - the Sew Precious by Simplicity. 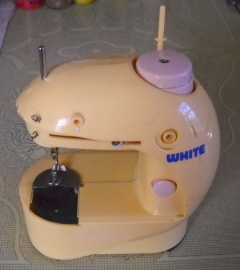 You can actually sew on this cool machine, but it's for a beginner, for sure. It does a straight stitch and a zig-zag. I'm calling it a "toy". It would be great for a child who wants to learn how to sew. 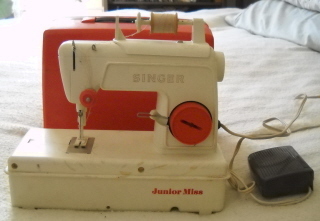 I also have the Singer Junior Miss. 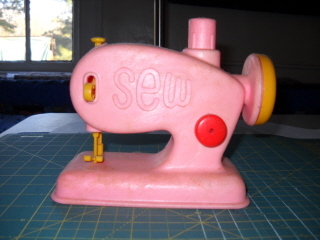 This toy machine also sews. It has both a plug and a battery compartment. It even comes with it's own carry case. When this machine came out in the store, I just had to have one. They originally came in three colors, yellow, mint green, and pink. I wanted one of each, but I just got the yellow one. I originally wanted it to sew at work on my lunch break, but it was a bit too noisy. A couple of years ago it fell off a tall pedestal, a crucial piece broke off, and voila - it became a toy. My middle son has put many hours of love playing with this machine. My youngest son is starting to take to it, too. I believe that's it for the toy sewing machine collection...for now...maybe someday I'll come across one of those antique metal toy machines, just begging to come home to my personal sewing museum. I have actually made quite a few patriotic quilts. Most of them are being used as quilted curtains in my home. 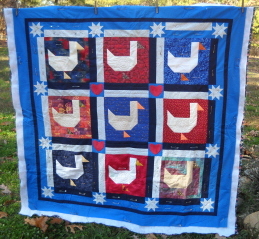 This Fourth of July Geese quilt started out as Fourth of July Ducks, but I think the necks are too long for ducks, so....they turned into geese. Duck, duck, goose! I need to finish hand-quilting this one. It is close to complete. Maybe by the next Fourth of July. 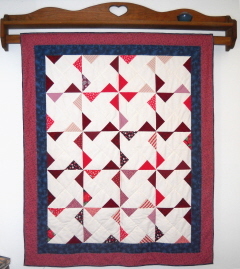 This quilt is also patriotic and the pattern is available in my shop, curlicuecreations.com. 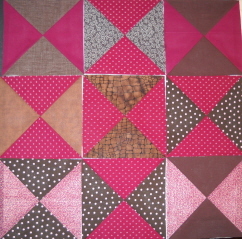 It is a quick and easy paper foundation pieced quilt. The finished quilt is a good size for a wall hanging, lap quilt, or crib quilt. Order the pattern now, and you could have it ready for your next Independence Day picnic. This week I wanted to start quilting the Ice Pellets quilt. The Ice Pellets pattern is also for sale at curlicuecreations.com. Unfortunately, I do not have enough safety pins freed up for basting. I really need to finish some of those UFO's, like the Fourth of July Geese quilt. I did get back to working on quilting the "Love Trip Around the World" quilt, shown below. I freed up a few safety pins from that one. It is a huge quilt. It's going on my king size bed...someday. That picture is from before the borders were joined to the top. It has two plain borders, one medium blue, one navy. 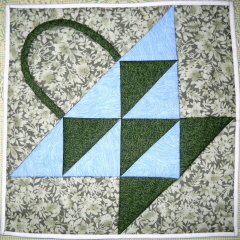 I also worked on the Faith applique block pattern. This block finishes at 12". 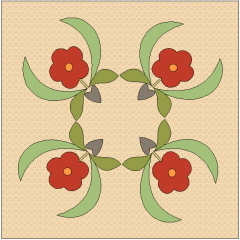 Four other applique block patterns are to follow, Joy, Hope, Peace, and Love. Books. 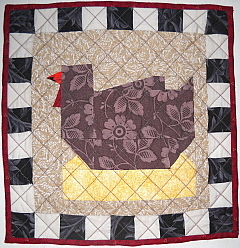 The Chickens in the Kitchen quilted trivet shown above is available for $19.00 plus shipping. It measures 9" x 9". 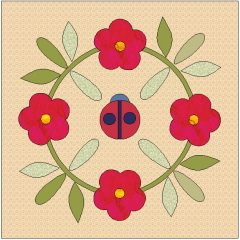 If you prefer to make your own, the pattern is also available in the Quilt Patterns section. Be sure to browse the Craft Books section for a variety of books, some vintage, some not. 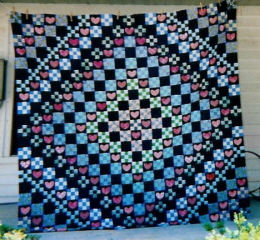 If you make a quilt from a Curlicue Creations pattern, please send a picture and I will post it on the blog. I would love to get a Curlicue Creations online quilt gallery set up for everyone to share their quilts. Please be sure to visit the Curlicue Creations Facebook page and click the "Like" button! We need to get 25 likes to get it going. Have a super Independence Day!